I usually keep this handy and add it on all my Dals, Sambars. Once the dal/sambar is cooked totally, add a spoon or two of this podi (based on quantity of dal/sambar) and boil for few mins for the taste to blend. Do not boil too much as the aroma will be lost. It gives a good smell and enhances the taste of the dish. Roast all the above it very little oil and grind to powder. Red Chillis - 20 (Mine are moderate hot long red chillis). 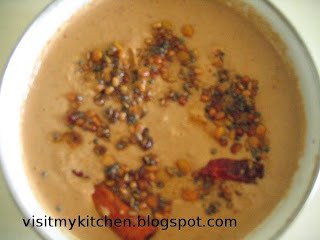 Heat Tava, in very little oil (as used for tempering) fry Urad Dal,Red Chillis and Hing. 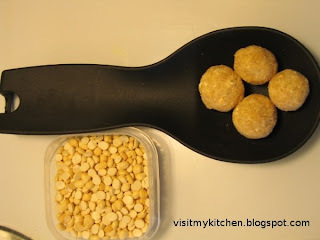 Once cooled, grind it to fine powder in mixie adding Roasted Channa Dal,Salt and finally adding Jaggery. Be careful while adding salt, even less is fine as it could be added later on in the powder if at all required. Ideal combo for Milagu Kuzhambu or Milagu Rasam. In little oil fry the Dal,Pepper adding coconut finally. Grind by adding water little by little. Add salt. Quite simple and heavenly to have. The usual combo for this is Paruppu Thogayal, made with Tur Dal. Whole process will take less than 15 minutes. Heat Tava. Pour 1 or 2 spoons of oil and fry all the ingredients (To grind) till the aroma comes. Grind to paste adding little water. Make tamarind extract to about 1 cup. In a tava, temper Mustard and add tamarind extract and boil for few mins. Once it starts boiling, add the ground mixture, add salt and let it boil. In few minutes the whole mixture will thicken itself. Switch off. Peanuts and peanut butter are whole foods that pack a lot of nutrition into just one serving. In the legume or dried bean family, peanuts are a terrific protein source. Research studies on large groups of people have found that people who often eat peanuts and nuts have much lower risks of heart disease. Also, scientists are finding that diets high in monounsaturated fats, the type found in peanuts, may also protect against heart disease. Peanuts and peanut butter are whole foods that contain a variety of vitamins and minerals, ample protein and beneficial unsaturated fats. Since they are a plant food, they naturally contain no cholesterol. Peanuts and peanut butter contain high quality plant protein. When comparing peanuts to similar foods, peanuts have more protein than any other legume or nut. This is especially important for children, vegetarians and people eating more meatless meals. Peanuts and peanut butter contain mostly beneficial monounsaturated and polyunsaturated fats. These fats as compared to saturated fats have been shown to help lower blood cholesterol levels. Lowering your blood cholesterol level may reduce your risk of coronary heart disease. One ounce, or one small handful of peanuts contains 2 big grams of fiber. This is 9% of the fiber you need each day! One ounce of peanuts provide 16% of your daily need of vitamin E. Vitamin E has been shown to act as an antioxidant which may reduce the risk of coronary heart disease. Peanuts are an important source of essential minerals such as magnesium, copper, phosphorus, potassium and zinc. Some of these "hard to find" minerals such as copper and magnesium may protect against coronary heart disease. B vitamins such as folate can help prevent birth defects. They also reduce amounts of homocysteine in the blood that may be a risk for heart disease. Peanuts are a good source of folate. Phytochemicals are natural substances in plants which may provide a wide range of health benefits such as reducing the risk of coronary heart disease. Peanuts contain resveratrol which is one of the many phytochemicals found in plant foods. Asparagus was some sort of Greek and Latin word till a week back. I saw that it is available in Plenty, especially here in Michigan. When I googled about it, I was amazed at the the nutrition value it has. Contains so many vitamins. Mainly, a very good Kidney tonic. When I tasted it raw, it wasnt that bad, I felt I can even eat it raw with a bit of salt. It tastes mild and hence suitable for almost all of our Indian cooking in Sambar/Kootu/curries. Chop of the woody bottom of the stem (as we do for the Keerais (greens)) and can cook just like our beans. I tried the below two types as of now. 1) Chop of the woddy bottom (Just like keerai thandu, u can do it with your hand it automatically cuts itself right till the woody portion). Chop it like beans and drizzle some olive oil, pepper and salt and bake it in 475' F for 20-30 mins or till done. Take it out when half done, sprinkle some cheese on it. 2) Chop it like beans, steam it lightly and add curry powder and salt. [ I use curry powder made of Dhaniya + Channa dal + Red chilli ] and it goes great with many vegetable like Brinjal, Capsicum. Junnu is a simple elegant dessert, a delicacy in Andhra Pradesh. Also called Ginnu in Kannada and Kharwas in marathi. It is made with Colostrum (Buffalo / Cows milk from the first couple of days after it has given birth to a calf). 'Seempaal' as called in tamil. As its not widely available,especially for the Indians in USA, I see that there are several alternatives to try this dish. I tried the below version and it gave a good ouput. but as I wanted to use the Jaggery version, I used unsweetened Khoya (Milk boiled to 1/4th of original quantity). Boil the whole milk and dissolve the jaggery in it. Bring it to room temperature. Beat the egg well, add the unsweetened khoya, whole milk, pepper and elachi. Mix well. A toothpick inserted should come out clean. Once it cools down,refrigerate for min 4-5 hrs and serve. This one, I call as 'Modern Payasam' :) Couple of years back, when I first had it at my aunts home, I really thought its about adding the 'Caramilk' Choclate to the payasam or something like that. Oh ! Such a dumbo I felt, when I googled about it. 'caramelisation' is the oxidation of sugar, a process used extensively in cooking for the resulting nutty flavor and brown color. Boil the milk till thick. Heat a heavy pan till it gets very hot. Add 1 tbsp of sugar. Do not stir or do anything at all. The sugar will start becoming brown. Well, that is, the sugar will start caramelizing.When it becomes nice thick brown add 1/4 cup of hot water (Here, be very careful to add it cautiously, coz the caramelized sugar will sizzle and splash a bit at this stage). Roast cashews,raisins, elachi in ghee and add. You will have nice brownish pink payasam ready. This process of caramelising the sugar can be done in any payasams like Semia / Vermicilli payasam, Rice payasam. Just caramelise 1 tbsp of sugar first as did above, and then continue with the usual way of making payasams. Wash well, cut the tomatoes. Pressure cook with Dal and a pinch of turmeric. Once cooked, add tamarind pulp, salt. Simmer till it blends. Tamarind could be avoided if tomatoes are too sour. Goes very well with rice. The Dal,if divided equally between Tur and Moong Dal and cooked in above method goes good with Rotis too. Grind the corn with ginger,chilli and salt adding water as required to make a thick batter. Add finely chopped onions to the batter. I was rattling around my kitchen not finding any snack item. I quickly remembered this and its ready in a jiff..My mom makes this everytime when she prepares ghee out of butter. So the fresh taste of ghee, makes this awesome. This is ready in less than 10 mins but absolutely no compromise in taste. It tastes superb.. Grind together Pottukadalai and sugar to fine powder. Heat the ghee till its slightly hot and add it to the powder, so that it helps in binding well. Using your palm and fingers, press slightly, start rolling it to balls. Press it gently. If you apply pressure at this stage it will fall apart and wont come in shape. If the ghee is not enough to make the balls, then add milk, very little by little till it can hold to shape. -- Though bigger urundais looks great, sometimes it chokes u, when u try to gulp them fully, else spills all over when u bite it to pieces. I prefer making the urundai's little smaller, comfortably enough to get into your mouth. I hate to eat things that doesnt fit my mouth. I, as many others, am a big fan of hotel sambar. Can drink it without any tiffins to go with it too. Tried the below recipe and it came out very well. Wash and Boil Moong Dal,Tur dal along with the vegetables. Temper mustard,Hing, little bit of methi. Add the cooked dal,Turmeric, tamarind pulp,sambar powder,sugar and let it boil. Dry fry and grind the ingredients (Given in grind to paste) with little water. When sambar is almost done, add this paste and cook for 5 - 10 mins and not more. Wanted to try out some American veggies too and my first attempt was with Avocado. Made pachadi / chutney out of it. Goes good as side dish for tiffins, though not so exciting in rice. Scoop the avocado pulp, grind along with green chillis,salt,cumin and curd. Add water to make the paste, if required. Tamarind - Small lemon sized. Dry fry the groundnuts well till brown. Once its cooled, grind it along with Tamarind,Red Chilli and Salt to fine paste, pouring required amount of water.